Jamie claims that this is his most powerful method to date & that it’s the same method he himself has personally been using to make his own money online… But is he really telling the truth & is it legit? Or is Wealthy Agency a scam that’ll just end up costing you more than you ever actually make? What Exactly Is The Wealthy Agency System? You’ll see exactly what I mean with regards to that in a few moments when I dig deeper into how it all works but basically the reason I say it’s not as good as it sounds is because in order to get paid for the service you’re firstly told to place advertisements – most of which cost money, so before you get paid you’ve still gotta spend a bunch of your cash on ads (with the risk of not actually earning anything back). So it might not be as great as it’s made out to be, but in the same breath at least his systems aren’t complete flat-out scams that just disappear with your cash without giving you anything in return (like many of the scam money-making systems out there). I’ll point out though that the method the Wealthy Agency system is built around is actually a pretty sound method (if done right) and it’s even a method I myself personally “kind of” blogged about many years ago. How Does Jamie’s Wealthy Agency Work? As I briefly touched on above the whole concept the Wealthy Agency program is based around is selling virtual services online – hence the name “agency” in the title as that’s essentially what you’ll be setting up. Promote a service such as graphic design, advertising etc.. So essentially you’ve created an “agency” because you’re advertising a service & then you’re hiring workers from various different websites to complete it for you. However there are a few problems with the method, and specifically a big one with the Wealthy Agency approach. One of the first problems is with the actual method itself – and it’s the fact that whilst the whole thing sounds good in theory, as I found out when I did it myself years ago you can quite easily run into complications. For example, the virtual service market is pretty darn competitive so in order to attract customers you need to keep your prices to a minimum… This means that there’s often very small profit margin between the amount you’re getting paid & the amount you’re paying the freelancers to carry out the work. If everything goes to plan then this isn’t a problem as obviously you’re still making money even if it is only small – however when things don’t go to plan & you have to go back to the freelancers to get them to alter work or make changes then this can end up actually costing you money (if you want to keep your customers happy which you will need to if you wish to see success). 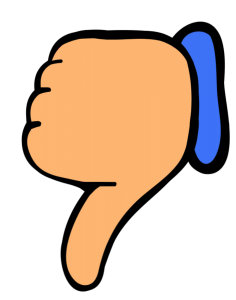 Also in the instances where freelancers don’t deliver the work to you on time or disappear completely (which surprisingly happens a LOT) it’s going to be you that’s taking the hit as you were the one that told the customer you were going to fulfil their order… This means you’ll likely end up with negative feedback & if that happens you’ll then struggle to get future clients. But the second problem is with Wealthy Agency itself, because whilst the Wealthy Agency system does indeed teach some free methods (such as posting ads on Craiglist & LinkedIn) it’s primary push is on paid advertising – and paid advertising especially if you’re new to it can be very risky. You see when I started out my agency I was pretty lucky in that I knew a lot of methods for getting free traffic, but if you don’t have that advantage then you’ll find yourself down the route of paid advertising & I can tell you first hand that it’s a route which involves a LOT of trial & error. I’ve seen people literally burn through tens of thousands of dollars in paid ads without ever seeing any profitable return on their investment. Sure, Jamie Lewis has massively hyped his Wealthy Agency program up to lure people in & the chances are you’ll never make the insane riches he talks about in the promotional video but I will point out that as far as I’m concerned the method taught via his program is indeed sound. It’s a working method & if you do work hard then it’s a method you could most certainly make money from. However if you’ve been led to believe by the video that it’s some sort of method which is just going to make you rich with little to no work then honestly I just want to point out that that’s not going to be the case. Like I mentioned above if you want to see any chance of making profits with the Wealthy Agency program then you should know that you’ll be responsible for posting & managing advertising, closing sales & organising freelancers to deliver the work. If that sounds like too much hassle to you though then FYI there are some easier ways to make good money online which you can see here. On the homepage of the Wealthy Agency system you’re told that you’ll be getting access to the program for just a low one-time fee of $29 but ultimately this is only half true as there are further costs on the inside. Like I say it’s not the worst thing in the world & the pressure on purchasing the upsells is a little less than many of the other programs I’ve seen recently but again I’d just much have preferred transparency from the outset. My Verdict – Is Jamie’s Wealthy Agency a Scam? Well in my opinion the program is certainly overhyped & I find it very unlikely that you’ll end up earning the amount of income talked above in the promo video but in the same breath I definitely wouldn’t say it’s a scam. 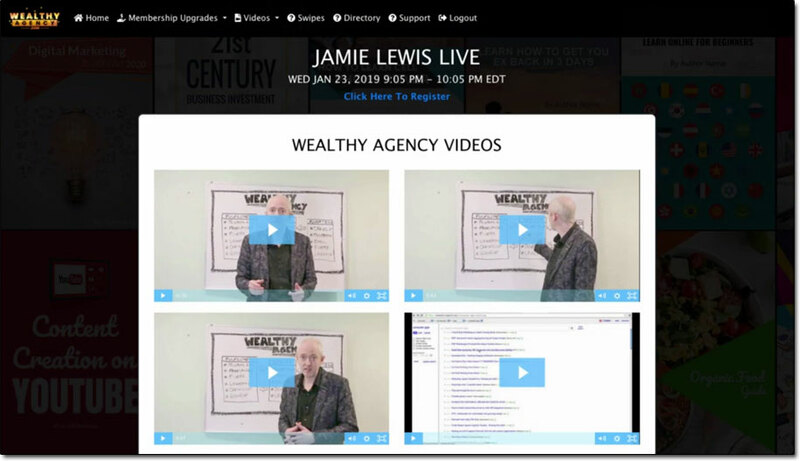 Jamie has put together some pretty good training videos inside of the Wealthy Agency program & as I mentioned throughout this review the method itself that it’s based around is actually sound & possible to make money with. It’s also very similar to the method that’s taught in Tai Lopez’s Social Media Marketing Agency program too. Tai’s program only really discusses social media marketing as a service though whereas Jamie’s program goes over a bunch of different other alternative services that you can also profit from as well. Plus Tai’s program is way more expensive! So yeah, for the fee of $29 if you’re interested in the concept of learning how you could make money by advertising services & fulfilling them online then I guess you’d find it fairly insightful… However if you’re expecting to “get rich” from it then sadly you’ll likely find yourself disappointed. For the latter reason I won’t be personally recommending the program – though I might have done if the sales pitch was a little more honest/less-hyped. The truth is after trying this method a long time ago in the past I came to believe that there are many better ways to make money online. And one of the my all-time favourite ways of making money online is something called affiliate marketing (which is much less stressful than trying to run an agency) and if that’s something you’re interested in too then you can get started with it for free over at Wealthy Affiliate. Is Big Profits Plan a Scam? Read My Review Before Signing Up!